The other night at the knit shop my friend Nicole and I were talking about cooking. 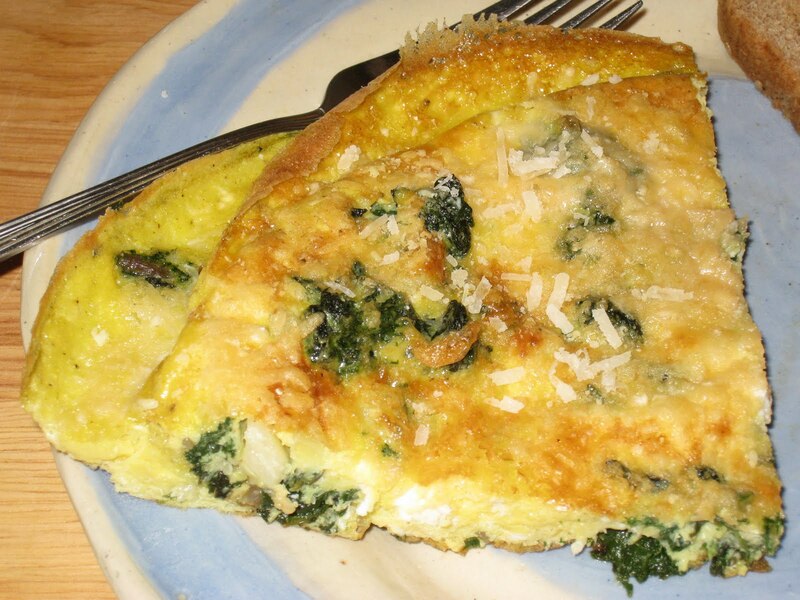 She mentioned that her mother had been on a frittata kick lately, and was cooking them quite often. I thought this was quite a coincidence because I, too, have been on my own little frittata kick. It started out when a friend told me that she was looking for something for workday morning breakfasts that she could make ahead of time and take into the office with her. She was thinking about frittatas and asked me if I had any recipes. I didn't, so I told her I would start looking. I didn't have to look far. Having recently acquired a copy of James Beard's American Cookery, I was pretty sure I would find a basic recipe there. I wasn't disappointed. I was, however, a little disappointed in my first frittata. It was dry, and the eggs were a little tough. It also made a mess of my cast-iron skillet, which apparently isn't seasoned quite as well as I thought it was. My second attempt went a little better, but still made a mess in my cast-iron skillet. I've been working on that, but in the meantime I decided I needed to use a different skillet. I turned to my non-stick skillet, which worked perfectly, but is just enough smaller that the 8 eggs called for in the recipe are just a little too much for it to set properly. With a little tweaking, I discovered that I could run my silicone spatula around the edges of the frittata as it is cooking and periodically lift up the edge high enough and tilt the pan toward the space and let some of the unset egg on top flow over so it runs along the bottom and has a better chance to set. You can see the result of that slight layering here, but I don't think it has any negative effect on the taste or texture. I keep thinking I should get a slightly larger skillet so I can make a smoother frittata, but then I realize that this one really does work just as well and I already have too many kitchen items. If I don't absolutely need it, I try to avoid buying it. Most recently, I have started using 7 eggs instead of the 8 called for in the recipe. I don't miss the extra egg and there's just that much more room in the pan. Another drawback to using this pan is that I can't put it in the oven, so I have to move it into my cast-iron skillet before I add the cheese and put it under the broiler. But it's not that much of an inconvenience and because it is mostly set, the bottom doesn't stick to the skillet like it did when I cooked the whole thing in it. Now that summer is here I don't bother with the oven. I slide the frittata onto a plate and then invert it back into the non-stick skillet, throw on the cheese, cover it, and let it cook for another ten minutes or so. The cheese doesn't really brown, but it's an acceptable trade off. 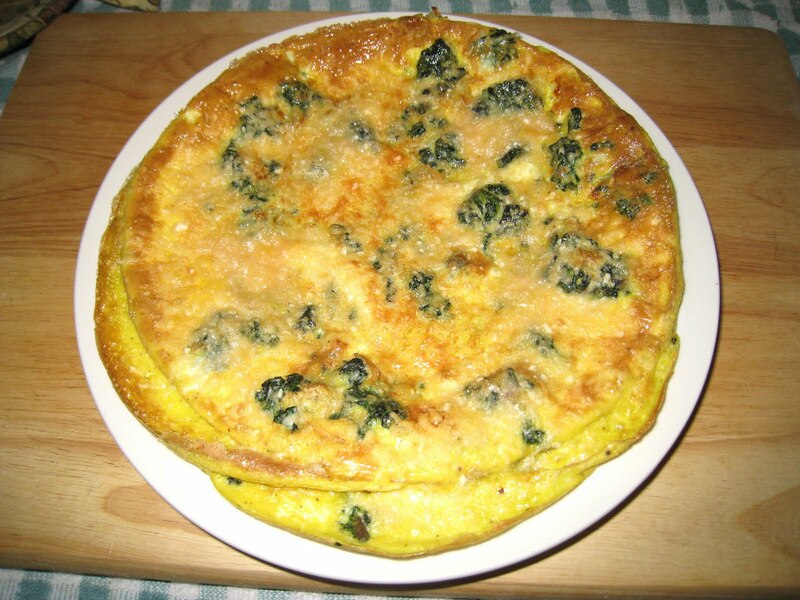 When made properly, a frittata is soft, moist, and full of wonderful eggy goodness. And they do travel well for a workday breakfast that hands-down beats donuts or muffins. Heat oil in non-stick or cast-iron skillet over medium-high heat. Add onions and garlic and cook until translucent. Add the greens and cook until warmed through. Crack the eggs into a large bowl. Season with salt and pepper to taste and then add herbs(s). Whisk thoroughly and pour into the skillet with the onions, garlic and greens. Lower the heat and cook until the eggs are set. If necessary, run a spatula under the mixture after it has started to set and lift up an edge to allow some of the unset egg mixture to flow to the bottom of the pan. You may have to do this more than once. from oven, take out of the pan, slice and serve. With a non-stick skillet: Once the frittat has almost completely set, either slide it into an oven-proof dish and continue as instructed above, or slide it onto a plate then invert it back into the non-stick skillet so the top is now on the bottom and the egg can set. Sprinkle the cheese over the top, cover, and cook another minute or two until the cheese melts. Variations: zucchini matchsticks, peas, sun-dried tomatoes, red bell peppers or mushrooms are just a few of the items that can used in a frittata.